Last week I mentioned that I now think that stress is more of an underlying issue than my diet is when it comes to my chronic illness and issues like ADHD and that focusing on reducing that stress would probably be a more effective lifestyle change than following a restrictive diet. In this post, I’d like to elaborate a little more on why stress is a big factor in chronic illness (and mental health) and some of my sources of stress that I’m trying to reduce and/or cope with better. It’s also well-established that depression and anxiety can stem from or are responses to stress, and particularly chronic stress, and obviously, being depressed and anxious affects how you view your life! Unresolved trauma is a particularly intense chronic stressor. 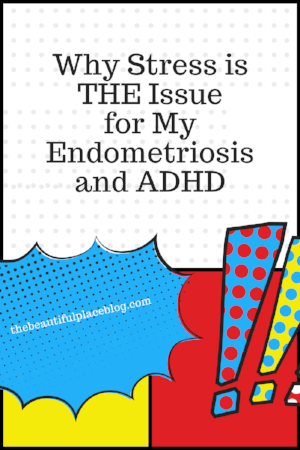 I also realized that I’ve had a few other sources of chronic stress that have probably been major factors in my anxiety and depression that have not helped my endometriosis or ADHD. Undiagnosed codependency. A codependent person is, according to Melody Beattie in Codependent No More, is "...One who has let another person’s behavior affect him or her, and who is obsessed with controlling that person’s behavior.” I’ve mentioned that I have codependent tendencies in the past, but recently my counselor has helped me see that this is a very big issue for me (it’s linked to perfectionism, for one thing, and goodness knows I struggle with that), and I now attend Codependents Anonymous. I’m sure I’ll write more about this in the future, but for now, it’s pertinent to know that codependency can lead to not only anxiety and depression but a whole host of other issues, from addiction to ulcers. Years of drinking lots of caffeinated beverages and/or not prioritizing sleep/exercise. This is one that I’m a lot better about now, especially since I don’t really drink much caffeine anymore, but coffee was a big part of my life for the past ten years, and I’ve always been a night-owl who’s struggled to consistently exercise. While the caffeine probably did help me manage my ADHD, too much of it still isn’t great for your overall health (and I know it's particularly bad for endometriosis and anxiety). I think my college years in particular threw my body and brain for a loop. I know now that drinking too many fluids in general can be bad for your metabolism, and low metabolism profoundly affects your health. Drinking a bunch of stimulants, no less, is even more stressful to the body, as is not sleeping enough or getting a decent amount of exercise. So it seems to me that things like trauma, codependency, and years of little sleep + lots of caffeine had a deeper impact on my health than not eating enough salad, and it’s where I’ll place my focus with counseling, support groups, and trying to get more sleep and being more active. I’ll still make sure I’m eating enough food and find out if I actually do have celiac, but otherwise, eating the right food doesn’t seem to be the main issue. I know that dealing with stressors won’t “cure” me of my endometriosis or ADHD (or at least I have to remind myself of that! ), but they certainly won’t make it worse, and may even make it a little better.